Hair Oils – Are they any good? Coming from a girl with a serious amount of hair on her head I think hair oils and masques are essential! I have thick red hair which grows quickly. I use hair dryers and curlers which don’t exactly help your hair so I need to use products that will restore the damage to my hair. I was lucky enough to be sent Matrix Oil Wonders in ‘Indian Amla’. This particular oil from Matrix is designed to strengthen your hair – perfect for my hair type. Personally my hair is so important to me so I will invest in good quality products. You may think from pictures of me that my hair looks so strong and healthy but it didn’t get that way on it’s own, we all need a little help from time to time! So what are the benefits of using a hair care product with ‘Indian Amla’ in it? Amla is used in many hair products because it enriches hair growth and hair pigmentation. It strengthens the roots of the hair, maintains colour and improves the shine of your hair. Amla oil is very popular in India because it has been shown to reduce the chances of hair loss and baldness. 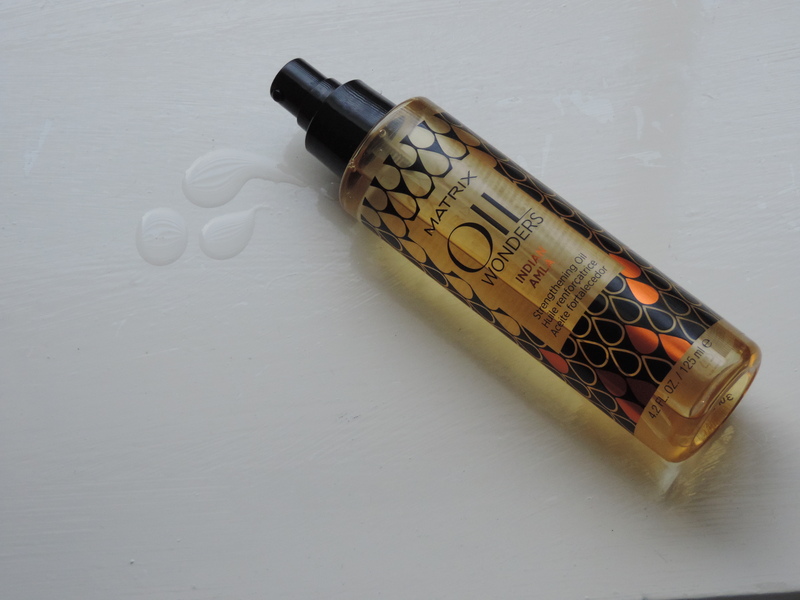 I have been using Matrix Oil Wonders for the past 10 days along with my house mate Aimee. This product is multi-use so we did a combination of applying to dry hair and wet hair. Aimee has blonde curly hair and does not add any heat to her hair but still finds her hair dry so she applied when her hair was wet. I used the Matrix Indian Amla Oil when my hair was both wet and dry. I love applying it to my hair when I come in from work and I’m just chilling at home. One thing that I really loved about this hair oil that is different to others is that my hair was not greasy after using. This meant I could still apply to the ends of my hair and go out or meet friends and it smelled great too. The scent of this hair oil would be similar to cinnamon. Who doesn’t love a hair product that smells amazing!! Weak and damaged hair need suffer no more – restore your confidence in your hair by treating it with this strengthening oil. In no time at all your hair will stand out from all of the other heads in the crowd, and will smell the best too!! You can buy Matrix Oil Wonders in selected salons and online here on BeautyBay.com. RRP €12.50. Posted in Hair, Must Have ItemsTagged Amla, Hair Care, Hair Oil, Indian Amla, Matrix Oil Wonders, Strengthen hairBookmark the permalink. Cleansing Water from Garnier, Tell Me More!